Kansas City, Mo., was the host city for the 119th VFW National Convention, July 21-25, 2018. A number of distinguished guests and award recipients, as well as President Trump and a number of elected officials from Missouri and Kansas appeared during the weeklong event. In addition to an address by President Trump, the Chairman of the Joint Chiefs of Staff Gen. Joe Dunford, Command Sgt. Maj. William F. Thetford, Dr. Barbara Van Dahlen (Founder & President of Give An Hour), Maximilian Uriarte (author of Terminal Lance comic strip about the US Marine Corps life) and Andrew Lumish (the “Good Cemetarian” who restores fallen hero headstones) all received VFW national awards. We want to especially thank Medal of Honor recipient and State Funeral National Board Member Donald “Doc” Ballard, and Missouri State Chairman and Woody Williams Award recipient Richard LaBrash, for teaming up to actively represent the State Funeral Mission at the Convention. “Doc” Ballard was honored to stand at the podium in front of the entire assembly to personally promote the State Funeral Mission and objective to petition the President. Before President Trump spoke, “Doc” Ballard was personally approached and embraced by 4 Star Gen. Joseph F. Dunford, Jr., Chairman, Joint Chiefs of Staff. This was an honor that will not be forgotten by both Ballard and LaBrash. After the President spoke, our National Board Member Donald “Doc” Ballard PERSONALLY handed a SPECIAL LETTER TO THE PRESIDENT FROM THREE MEDAL OF HONOR RECIPIENTS (our two national Board Members – Don “Doc” Ballard, James “Doc” McCloughan – plus “Woody” Williams). We greatly appreciate the time and efforts by both “Doc” Ballard and Richard LaBrash for working the floors of the Convention with State Funeral Petitions and promoting the Mission throughout the four days of the Convention. 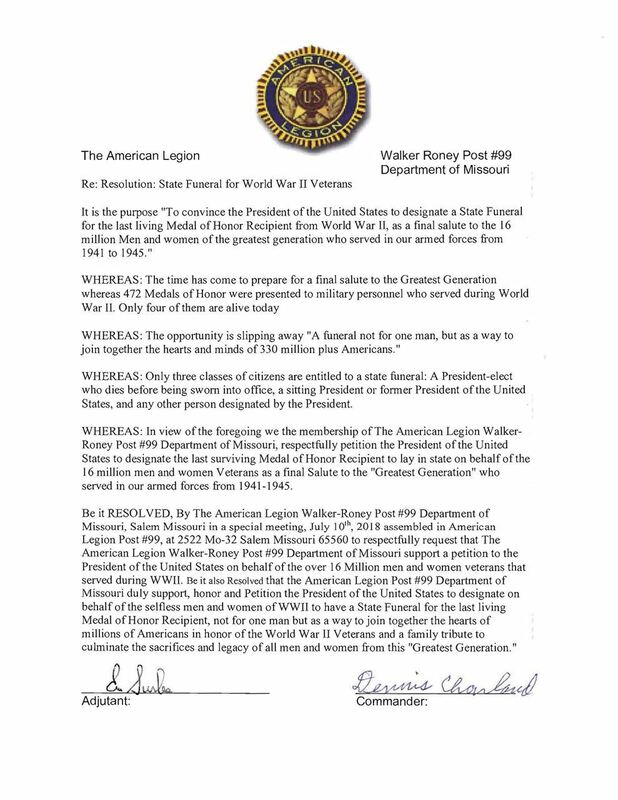 RESOLVED, By The American Legion in National Convention assembled in Minneapolis, Minnesota, August 28, 29, 20, 2018, That The American Legion support a petition to the president of the United States, on behalf of more than 16 million veterans of World War II, to designate a state funeral for the last living Medal of Honor recipient – not for one man, but to join together the hearts of millions of Americans in a unifying event honoring the legacy of all World War II veterans. 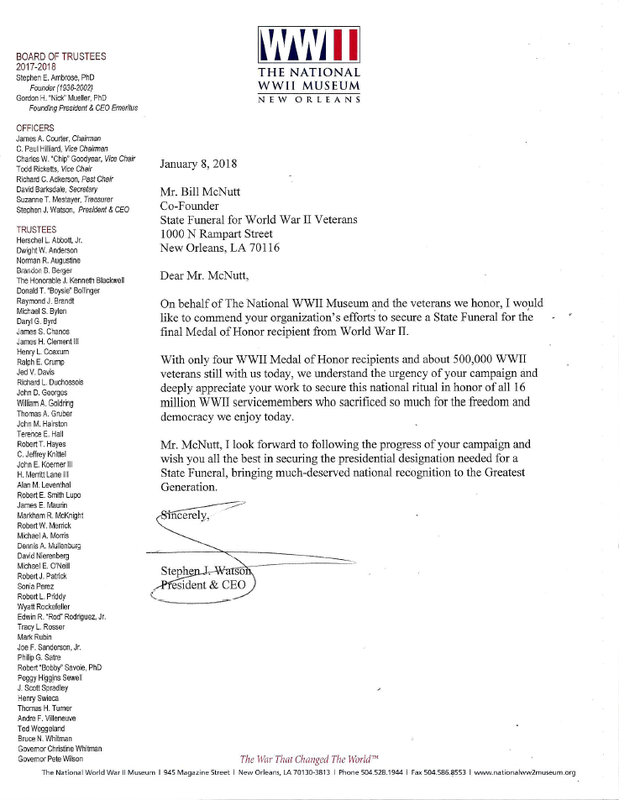 It is the purpose "To convince the President of the United States to designate a State Funeral for the last living Medal of Honor Recipient from World War II, as a final salute to the 16 million Men and women of the greatest generation who served in our armed forces from 1941 to 1945." WHEREAS: The time has come to prepare for a final salute to the Greatest Generation whereas 472 Medals of Honor were presented to military personnel who served during World War II. Only four of them are alive today. WHEREAS: The opportunity is slipping away "A funeral not for one man, but as a way to join together the hearts and minds of 330 million plus Americans." WHEREAS: Only three classes of citizens are entitled to a state funeral: A President-elect who dies before being sworn into office, a sitting President or former President of the United States, and any other person designated by the President. WHEREAS: In view of the foregoing we the membership of The American Legion Walker-Roney Post #99 Department of Missouri, respectfully petition the President of the United States to designate the last surviving Medal of Honor Recipient to lay in state on behalf of the 16 million men and women Veterans as a final Salute to the "Greatest Generation" who served in our armed forces from 1941-1945. Be it RESOLVED, By The American Legion Walker-Roney Post #99 Department of Missouri, Salem Missouri in a special meeting, July 10th, 2018 assembled in American Legion Post #99, at 2522 Mo-32 Salem Missouri 65560 to respectfully request that The American Legion Walker-Roney Post #99 Department of Missouri support a petition to the President of the United States on behalf of the over 16 Million men and women veterans that served during WWII. Be it also Resolved that the American Legion Post #99 Department of Missouri duly support, honor and Petition the President of the United States to designate on behalf of the selfless men and women of WWII to have a State Funeral for the last living Medal of Honor Recipient, not for one man but as a way to join together the hearts of millions of Americans in honor of the World War II Veterans and a family tribute to culminate the sacrifices and legacy of all men and women from this "Greatest Generation." Serving in the armed forces is not for everyone, but respecting and honoring those who sacrificed so much for our country is. I did not serve in the United States military but I am driven to honor those who both gave their lives for our country and many years of their life fighting overseas and protecting the home front. State Funeral for World War II Veterans is the perfect way that I can quench my thirst to honor all those who fought in the Second World War. A state funeral for the last living Medal of Honor recipient would both honor the sacrifice of all those in the armed forces, but also bring our country together during these increasingly divisive times. Everyone in the nation should support our troops that are currently serving and have served. Signing the State Funeral for World War II Veterans’ petition is just the first step I will take to ensure that the men and women that served in the Second World War receive the honor they deserve. I hope you will join me in supporting this effort. Americans of all races and ethnicities served with distinction throughout World War II. Native Americans served their country in a higher percentage than any other race during the Second World War. The most famous group of these Native American soldiers is the Navaho code talkers. Their contributions were vital to the success of the Allies in winning the war. Native Americans also served our nation in many other ways. Pima Indian Ira Hayes was one of the four brave men who raised the American flag over Iwo Jima. Joe Medicine Crow was the last member of the Crow Nation to earn the title of war chief and completed the four requirements (leading a successful war party, stealing an enemy’s horse, disarming an enemy, and counting coup) while fighting the Nazis. Edward McClish, of the Choctaw Nation of Oklahoma, escaped captivity while wounded in the Philippines and went on to organize a small guerilla band. His men engaged Japanese forces over 350 times and inflicted more than 3,600 casualties on the enemy. For all their bravery, a total of five Native Americans received the Medal of Honor for their actions in serving of our country during World War II. In total, 27 Native Americans have received the nation’s highest military honor, the Medal of Honor. There is also a memorial on the grounds of the National Museum of the American Indian for all those who served during the Second World War. Even though the Native Americans served with such bravery and distinction, they were still discriminated at home. Native Americans were not allowed voting rights until well after the Second World War, in 1965. Despite this and other injustices, the Native American population has continually stepped up to serve our nation in all conflicts with complete selflessness. The 2010 Census identified 150,000 Native American military veterans. We at State Funeral for World War II Veterans would like to thank each and every one of them for their service to our country. We would also like to recognize and thank our Founding National Board Member and Secretary, Mr. Adam Crepelle, a member of the United Houma Nation tribe. On September 16th, 2017, State Funeral for World War II Veterans had the privilege of interviewing Medal of Honor holder Woody Williams, Corporal U.S. Marine Corps. Williams is the grandfather of our Kentucky Chairman, Brent Casey, and Ohio Chairman, Bryan Casey. His heroic Medal of Honor action took place on Iwo Jima the day Marines raised the flag on Mount Suribachi. Woody Williams commandeered a flamethrower to take out many Japanese pillboxes to clear a path for American tanks. Q: We are organizing in all 50 states to petition President Trump to designate a state funeral for the last of you four Medal of Honor heroes from World War II. What do you think of our effort, Sir? A: I read the information and I totally agree with you…100%. The idea of a state funeral for the last of us to go is great. The nation needs this. It brings recognition to all 16 million of us who wore the uniform. A state funeral is part of our nation's history that can never be erased. Q: What do you think about the fact that many Generals have had state funerals, but never a state funeral for an enlisted soldier? A: That is a great point. This goes back to history. This tradition of state funerals for Generals has never been broken, but is should be. The Generals do the planning and give direction, but the grunts on the ground do the hard work. 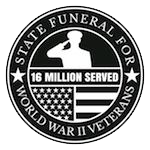 Q: What were your initial thoughts when you learned about State Funeral for World War II Veterans and our mission? A: It is a new idea. It is original. The thing that impressed me was the recognition to all 16 million of us who served in uniform in World War II. Q: What do you like best about our mission, Sir? A: The recognition at a state funeral should be for all, not just one man. And, the historical record of the last Medal of Honor recipient from World War II having a state funeral will have great historical value. Q: Is it OK if we put this short interview with you on your website? A: Please do. I support your efforts 100%. Q: Lets have dinner in NOLA Nov 15 or Thursday Nov 16, when you speak at the World War II Event. A: We will do it!